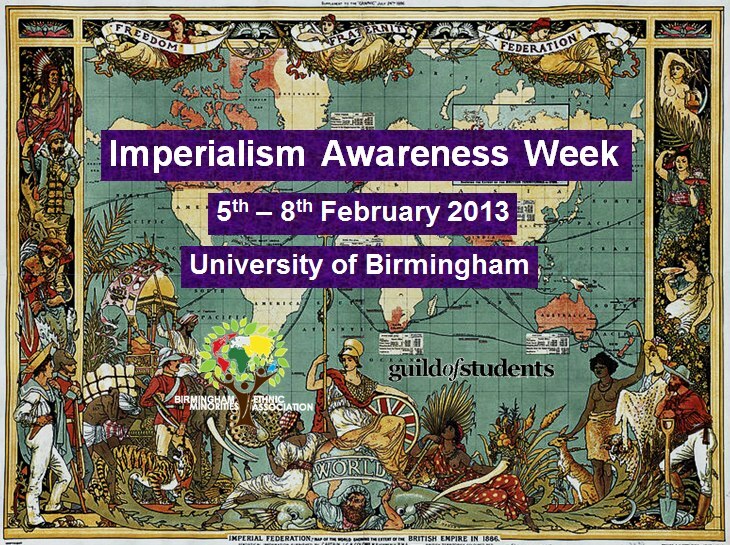 Imperialism Awareness week begins today! all welcome to come down and (re-)analyse the effects of Imperial colonialism on the formation and instability of the contemporary world, as well as the forms Imperialism takes on in the modern day. 6/2 The Scars of Empire – (6-9pm, Arts Main LT): Panel on legacy of empire in Palestine and Kashmir. Featuring speakers from the World Kashmir Freedom Movement, Al-Shabaka Palestinian policy Network and Islamic Human Rights Commission. In collaboration with Students for Justice in Palestine and Kashmir Awareness society. 8/2 The New Empire – (Arts LR5, 4pm – 7pm): Talk/Q&A on neoimperialism; how empire manifests itself in the modern day. Speaker is Assed Baig, journalist and reporter who has experience in Pakistan, Kashmir, Somalia, Libya and Palestine. Topics covered include the recent events in Libya and Mali, neoimperialism in South East Asia and mental colonialism.